Coordinates and snap-to-grid Kodu allows you to view the cursor's coordinates as well as snap-to-grid terrain. 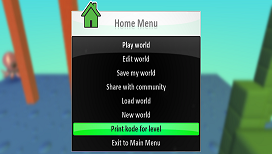 Print Kode Kodu has a feature that allows you to view the game's code written for the entire world. Re-center Camera Kodu allows you to re-center the camera in edit mode when it gets "lost". Screenshots Kodu allows you to capture a screenshot in the kode editor with the cursor, helps overlays and remove background. 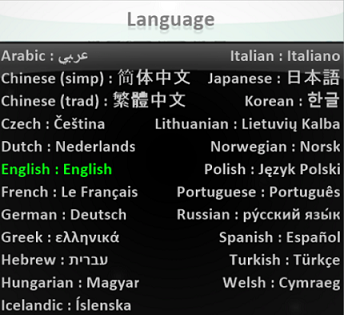 Language Kodu allows you to control which language is used. Score Visibility Kodu allows you to control how prominent the display will be for scoring events. Score Visibility Loud Labeled allow you to name a scoreboard. 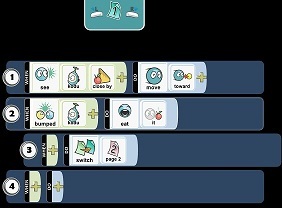 Secret Glyph Codes Kodu allows you to write world or level descriptions with pictures. Sky and Lighting Kodu allows you to create a mood for your game with Sky and Lighting setting. GUI Button Visibility Kodu allows you to react to a GUI Button on the HUD. Export Worlds Kodu allows you to save your Kodu game to your computer's hard drive. Creatable Kodu allows you to make a creatable to reuse the object when it has been used. Start Game With Kodu allows you to display the game description and a countdown when playing a game.